A wine you should know “Collector’s Edition”… 2009 Agharta “Mountain Terraces Vyd” Cabernet Sauvignon. So I’m periodically going to be posting this little series called “A wine you should know…”, focusing on specific wines, or maybe wineries, that aren’t mainstream but I feel should certainly be on your radar. The first installment of this series was LOLA’s 2012 Chardonnay from the Sonoma Coast made by Seth Cripe, and that article got a fair amount of attention which I was very happy about, as was Seth! I want to switch things up for my sophomore article, and I’ve decided to do something a little different called the “Collector’s Edition”. This is for the wine enthusiasts that thirst for the next tier of wines. Wines that are at a higher price point, or wines that should be laid down for a number of years before consuming. There are so many wines that could fit the criteria for this new branch of posts, so many wineries… Husic, Larkmead, Vincent Paris, Arnot-Roberts, Robert Sinskey, Orin Swift, Giacomo Conterno, Saxum, Carlisle, 100 Acres. How to choose!? You know what, I decided to stay true to my heart and go with a winemaker that I’m very passionate about right now, Pax Mahle. But even then it’s hard to decide, Pax has so many projects! Pax, Wind Gap, Lucques… he’s also the winemaker for Wilde Farm (love those guys!). No, I’m going super esoteric here, Mr. Mahle’s little known winery, Agharta (https://aghartawines.com/). So the word “Agharta” derives from a Buddhist belief of a subterranean Shangri-La. Some say that this underground paradise is inhabited by a group of Buddhist missionaries that entered a series of caves, never to be seen again. Others say that in this paradise lives the reincarnation of all the millions that have ever lived. Some believe that in this paradise the hills are made of gold and the rivers flow wine… Well that sounds good to me! More importantly to Pax, the name “Agharta” represents an album by Miles Davis. While Miles had many, Many, MANY successful albums, “Agharta” was always critically acclaimed by those “in the know”. In other words, let the masses listen to XYZ… but the chosen ones will be drawn to Agharta. And this holds true with Pax’s wine. Let the masses focus on Mondavi, Silverado, Stags Leap, Rubicon, Silver Oak, Quintessa, etc., but let the chosen ones, the ones searching for enlightenment, the ones willing to expand their minds, let them find Agharta! This project was started a number of years back by Pax, but it didn’t morph into Agharta until 2010, and his first vintage under the label was 2004 (some Syrah he had been hoarding for some time, man I wish I could get my hands on some of that!!! *hint hint Pax* *wink wink*). One of his newer projects is a Cabernet from the Mountain Terraces Vineyard, which is a moderately high elevation site overlooking Sonoma Valley. The first thing that is distinctive about this wine is that it undergoes a 75 day cold maceration on skins, which is absolutely unheard of! From there you’re looking at 28 months elevage in French barrel, about 50% new. So Derek, what does the wine taste like!?!? Yeah yeah, I know that’s what you’re waiting for… simmer down skippy! First and foremost, this is a pretty darn full bodied wine with legs that could put some Vegas showgirls to shame. The nose is a little dusty with aromas of mission fig, cocoa powder, dried herbs, subtle oak and reduced balsamic. The palate is surprisingly bright and balanced, yet extraordinarily complex, for a California Cabernet. Notes of black cherry, ripe plum, anise, dark chocolate, crushed red peppercorn, Tahitian vanilla bean and subtle oak are framed by stunning acidity throughout the palate as well as dusty tannins giving backbone and grip towards the finish. The finish is a little short, but it doesn’t leave you disappointed… Instead it has you reaching for another sip! Truthfully, she is still a little young. 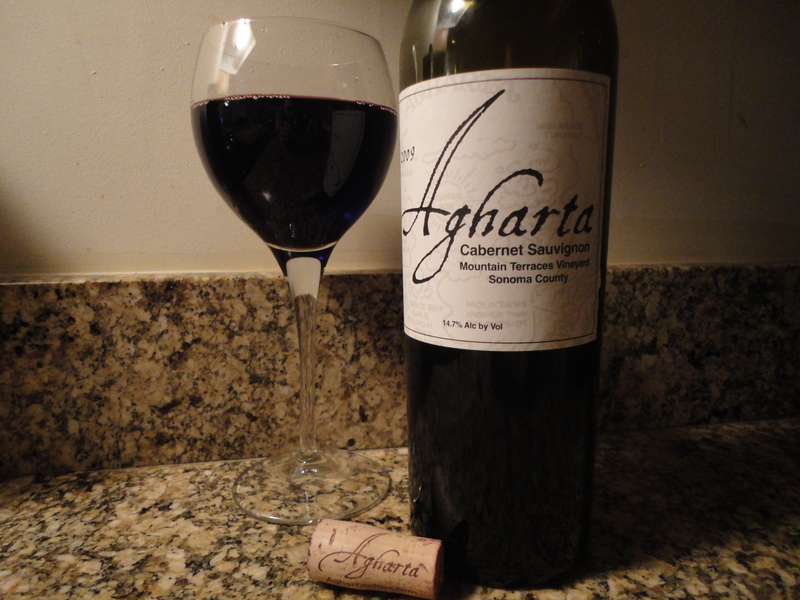 Most Cali 2009 Cabs probably don’t have much of a shelf life due to a distinct lack of acidity… but that is a non-issue here with this high elevation gem, Agharta’s Cab has enough acidity to let it age for years to come. Vibrant in its youth, this wine will become a masterpiece with some more age. I would say it’s best consumed from 2016-2020. As far as food pairings go, I find this wine to be very versatile thanks to its brightness and balance. You don’t need to necessarily go as big and bold as you would for a Napa Cab… Yes, steak and grilled chops would be great, but also things along the lines of roasted mushrooms, chicken balsamico, or duck with a dark fruit reduction would be perfect. So let’s talk scores. Tanzer’s International Wine Cellar gave it a 92… That is far too conservative! In my extremely humble opinion (ok, not THAT humble), Agharta’s Mountain Terraces Vineyard ’09 Cab deserves a 94+. That’s my story and I’m sticking to it! So that’s it for now. I’ll be posting some more articles over the next few days. In the meantime crack open a bottle of something cool, maybe even a “collector” wine, sip and relax. Life is short, enjoy it! Tags: agharta, mountain terraces vineyard, pax mahle, sonoma cabernet. Bookmark the permalink. Previous post ← Shrimp Risotto, poached lobster & seared scallops with a tomato butter sauce… Requested by Danielle P!